I know, it is another soup recipe. 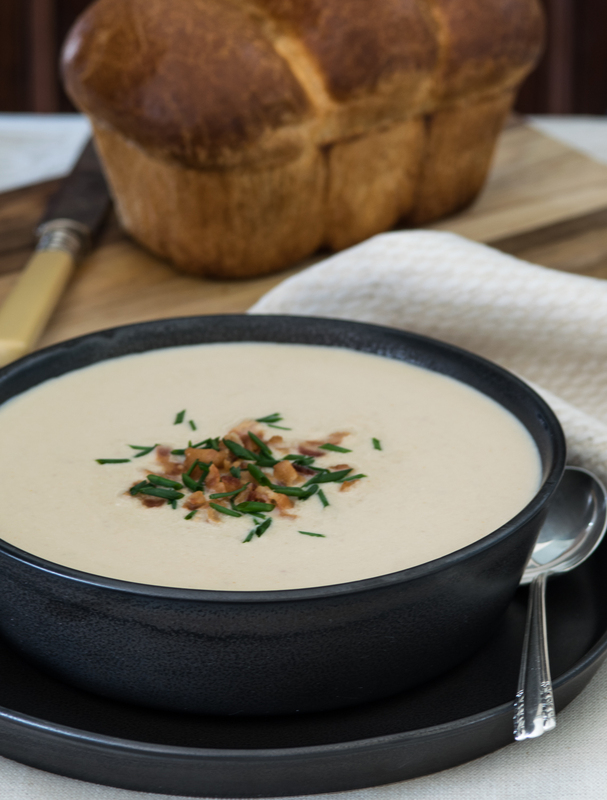 This Cauliflower Soup has become one of my favorite soups to make and eat. I puree the soup with my immersion blender, so it is smooth. The flavors are layered with cauliflower, potato, cayenne, Monterey Jack cheese and garnished with chives and bacon. The soup leaves a nice spicy taste in your mouth after every spoonful. In a large pot, over medium-high heat, cook the bacon pieces until crisp, about 5 minutes. Drain the bacon on a paper towel and set aside. Carefully pour off most of the grease and return the pot to the stove. Add the onions to the pot and cook over medium-high heat for 3-4 minutes. Add the cauliflower, sprinkle with the cayenne and black pepper and cook, stirring, until the cauliflower starts turning a golden brown, about 3-4 minutes. Add the potatoes. Stir in the broth, bring to a boil, reduce the heat to a simmer and cook for about 15-20 minutes. Garnish: Bacon pieces and chives.